I read a post recently about the 80s. I’m aging myself, but it really took me back. I still love to listen to 80s’ music. My daughter actually shares my taste in music and listens to quite a bit of the 80s’ stuff herself. We spent a recent evening downloading clips of what she calls the “oldies but goodies.” Gee…. I hate the fact that now what I listened to in high school is considered the oldies!! My daughter had 80s day at school a few weeks ago, so we had a great time trying to figure out her wardrobe for the day. (This was much more my speed than trying to tell her what they wore in the 50s. She’s still not convinced I wasn’t alive then. Of course, Mom predates everything, right?.) And true to character, Taylor informed me of 80s day about 12 hours prior to needing the outfit. But it was doable. 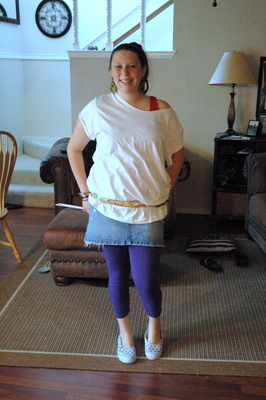 She wound up looking something like Flash Dance meets Debbie Gibson, or maybe even Punky Brewster. Either way, she looked pretty cute and she was satisfied. Her outfit was complete with – I hate to admit it – some huge green earrings that still call my jewelry box home. I don’t <shriek> wear them anymore, but some things I just haven’t been able to part with. Now I’ve got Debbie Gibson tunes going through my head. But for now, since I have to be up at 4 to take our exchange student to the airport, I think I’ll call it a night. But before I go, here’s a pic of my daughter on 80s day. Being a child of the 80s and a Texas gal, I think she needs bigger hair!